Hideaway Bins recommends the use of their bins to ensure efficient waste collection and recycling in commercial workplaces. The use of a Hideaway Bin in a commercial work environment, especially within a coffee station or a recycling centre, will efficiently assist with waste segregation and keep the workplace clean, hygienic and odour-free. A recent remodelling project at the Fisher and Paykel head office saw the installation of two 40-litre Hideaway Bins in the coffee stations. Mounted at bench height, the Hideaway Bins are designed to pull out towards the user, making the units both ergonomic and functional. True to their name, the waste bins remain discreetly concealed when the units close, complementing the minimalistic design of this office environment. Hideaway Bins keep commercial workspaces clean through the control of odours and bacteria. A friction-fitted lid remains in the cupboard when the unit is open, closing down over the buckets when the unit is closed to assist with odour control. The Clinikill antibacterial powder-coating on the lid features infused silver ions to fight bacteria, yeast and fungi, keeping the bin solution hygienic. Key features of Hideaway Bins also include high quality construction to withstand the challenges of busy commercial environments; framework made from high grade steel for strength, and powder-coated for durability and ease of cleaning; high quality runners designed to hold upwards of 40kg, over extending for easy removal of all bucket combinations from beneath the benchtop; buckets made from food grade polypropylene; and liner holder in the bucket designed to hold the bin liner in place. All the buckets are designed to fit the standard bin liners available from local supermarket chains. Hideaway Bins incorporate several distinctive features with a range of models available to suit commercial design requirements. 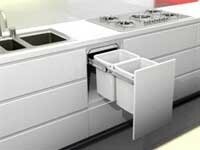 Hideaway Bins are easily available across Australia through Hettich, Nover and Galvin Hardware Distributors.